Adidas Vienna City Series trainers reissue at Size? 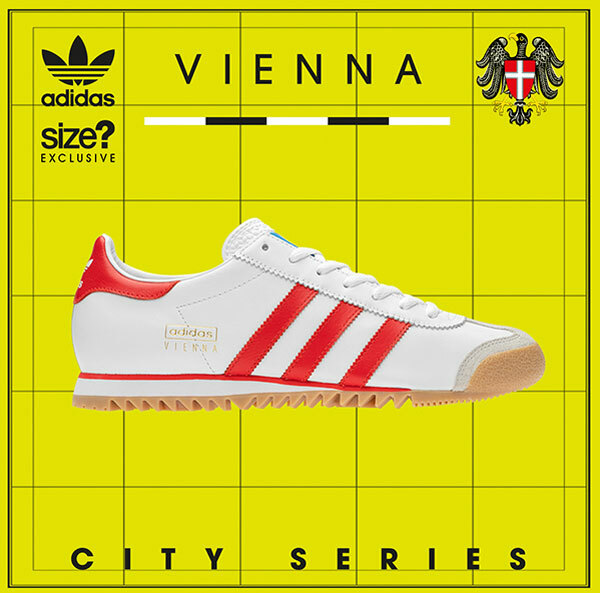 The Adidas Vienna City Series trainers reissue at Size? lands this week in limited numbers. So get up early that day if you want a pair. The ‘day’ is this coming Saturday (which is a day you probably didn’t want to be up early), with the likely selling time being 8am. If you want to go old school, you can queue up at a Size? store too, all of which should have stock. As for the shoe, that’s an update of the classic City Series release, not an exact reissue of the Vienna. Saying that, the shoe has changed over the decades, first being seen back in 1964 and updated with subtle changes in the 1970s, 1980s and 1990s. The 1970s saw a style with a red heel tab and rubber toe bumper sitting on an all-new ‘waffle profile’ outsole, in the 1980s, some versions had even adopted the ‘Jeans’ outsole and in 1990, the Vienna got two blue stripes and one red, instead of the all-red detailing previously seen. This new version has a custom sole unit which combines the Vienna’s ‘80s ripple gum sole with the split-coloured midsole seen on the ‘70s release. Above that, you are looking at original detailing on the soft leather upper, including ‘Vienna’ lettering in gold and signature three-stripe detailing in a vivid shade of red. So a mix of eras, but very much the Adidas Vienna. Compared to recent City Series releases like the Adidas Rom and the Adidas Brussels, these are likely to be much hard to secure. This is a one-retailer exclusive and as such, stock will be snapped up unless you get on it quickly. So make sure you do set the alarm on Saturday and have £85 ready to access.